These last few days I have been thinking about the next GSE and airliner models that I would like to do, and so I thought to start the list with a project that I have been wanting to do for a while. This project may be a little long but I am sure it will be challenging and enjoyful. The lenght of this project will be determined from the process of secondary items that will be linked very closely to this project. One of the parts that I like most of making these models is to gather as much information as possible; numbers, sizes, and lots of photographs. That is the only way to do things properly in scale and I think it is a very important factor, because it is easy to do something a couple milimeters longer which would be about 30cm longer in the real element. So from here, if anybody by any chance has access to one of these -8F or -400F freighters, I would be enormously grateful to receive reference photos that will surely help me a lot with this build and make it as accurate and detailed as possible. This B747-8F project will consist of the representation of the fully raised nose cargo door and fully opened side cargo door, with a cargo bay which will include the interior panels that will cover the whole inside of the model. This project will also include decals, these will be used for several things such as panel illustrations, and other signs. Two of secondary items that I mentioned before that may be build alongside this projects are; cargo pallets and a new cargo loader. The Commander FMC15i bridge can reach 3,55 meters, while the distance of the floor to the rollers of the B747-8F is of 5,05 m (lightweight aft) and 4,72m (heavyweight fwd). Thus the standard Commander FMC15i would not be able to reach the nose height. That is one of the reasons why these loaders can also be supplied with a double sill, which would increase the elevation. However in this case I am still unsure about if I would like to make a new and bigger loader or create a variation with the double sill from the current model. 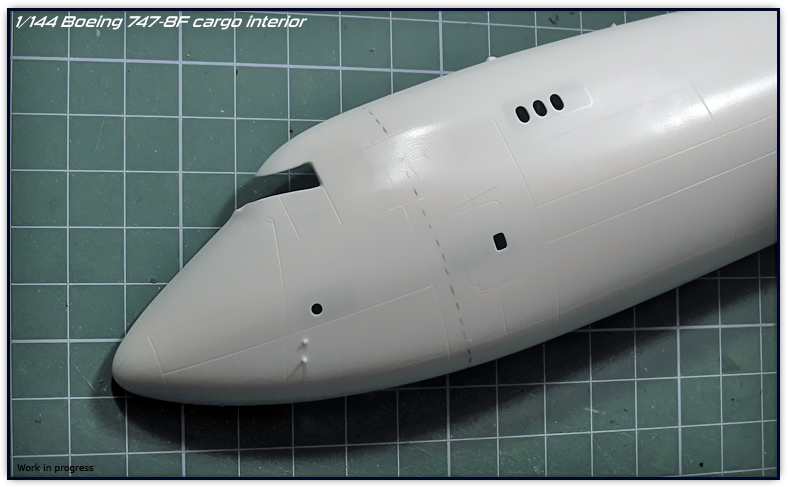 Things that concern me are how to build-add the whole cargo compartment inside the kit’s fuselage, which for this build, I am going to be using Revell’s Boeing 747-8F kit. But that is something I will be thinking about prior doing any cuttings. 1- Once the nose is separated, there is a lot of things going on in that front section, such as the different elements like the hinges which will be placed on the plastic profile, the structure right under the cockpit windows etc. 2- To ease on the building/adding the whole set. Although the nose can be considered a separate part, there is also going to be detail on the forward section, so I think that having that whole section will be later easier for everybody to just make a cut on the kit’s fuselage and incorporate the front detailed section. The place where I situated the cutting line was decided based on the panel lines. I would not like to cut on top of a fuselage line, because when joining the front section, the addition of putty or the work with the sanding paper would erase that line. So in this way is very easy to glue the front section in a smooth area, add masking tape at both sides while applying putty or sanding and therefore conservating the vertical panel lines. Obviously it is impossible to do a cut such as this without having to go through a panel line, but it is easier to do a small cut where the horizontal lines meet rather than a long cut where the vertical panel lines are. 3- It will be easier for me to work with both front section halves glued, since I will be placing the structure under the cockpit windows etc. 4- The connection of the ladder to the cockpit, which may lead me to make a cut past the L1 door so that I can make the door opened and provide the door already open in the fuselage. This makes me think that it is possible that photo etched parts (like the ladder) will also be done. Cutting past the L1 may be the best solution, after all it is normal the L1 to be open while loading the cargo, so that is something I will probably do. Another of the things that I will be taking into consideration is the possibility to port this to a -400F type. So I will take a look to see if the floor / rollers layout is different from both the -8F and the -400F. A bit long project in which I should consider all possibilities before doing a cut, despite some of the new GSE items I like to make, the fuselage of this 8F is already on my desk. In a few days I would like to comment on which will be the other items I would like to start, but in the meantime, I continue preparing the upcoming stock units of the items I already made.